You are here: Home � All Deals , Outdoors: Sports Travel Cameras � NIKON D90 DSLR with 18-105mm Lens on sale now for $1031.89 plus get an extra $200 off when you add a Nikon 70-300mm f/4.5-5.6G ED-IF AF-S VR Zoom Nikkor lens to your order. 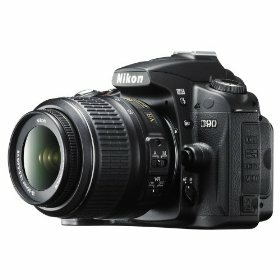 NIKON D90 DSLR with 18-105mm Lens on sale now for $1031.89 plus get an extra $200 off when you add a Nikon 70-300mm f/4.5-5.6G ED-IF AF-S VR Zoom Nikkor lens to your order. Amazon is selling the popular Nikon D90 DX 12.3MP Digital SLR Camera with 18-105mm f/3.5-5.6G ED AF-S VR DX Nikkor Zoom Lens for $1031.89. This camera usually sells for hundreds of dollars more. Plus if you buy this second lens with the camera: Nikon 70-300mm f/4.5-5.6G ED IF AF-S VR Zoom Nikkor Lens for Nikon Digital SLR Cameras , you will save an additional $200 off your order. This camera has been reviewed on Amazon.com over 200 times, and has received an overall satisfaction rating of 4.8 out of 5 stars. Includes a 5.8x AF-S DX Nikkor 18-105mm f/3.5-5.6G ED VR lens. You can read reviews of this camera and see this offer by clicking here.